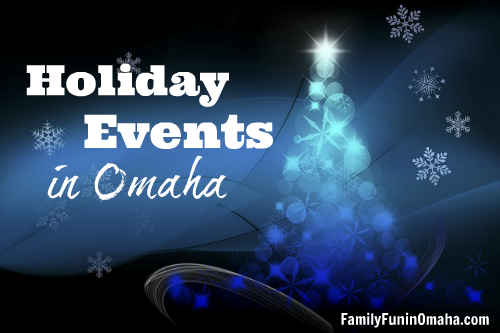 Looking for Amazing Christmas Light Displays in the Omaha Area? 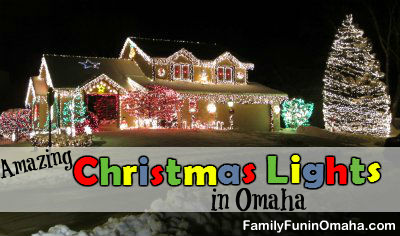 Find the best Christmas Lights in Omaha full of beautifully decorated houses with bright lights, inflatables, decorations, and some with thousands of lights choreographed to music! Thank you to all who have put the time and effort into creating these displays for everyone to enjoy and to everyone who has helped us keep the list updated! IMPORTANT NOTE: Please help us keep this list as updated as possible. If you have updates for 2018 on any of the light displays listed, or if you know of other light displays that should be added, please email us. 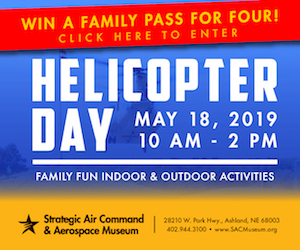 When possible, the website or Facebook links are included for the displays, plus details that were sent to us by either the person who created the display or by a reader who visited the display. 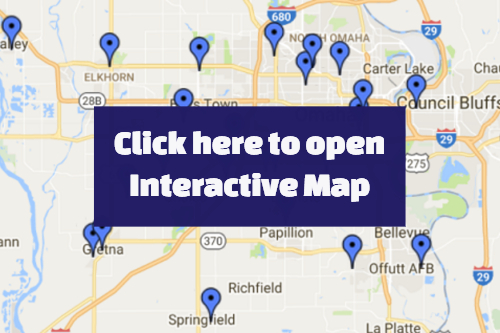 Interactive Map: Green = Houses, Red = Neighborhoods. √ 2018 = Houses that have been verified for 2018. Lighting Ceremony will be held near 24th & Lake Streets (in Dreamland Park) at 4:30 p.m. on Saturday, December 1, to close out Christmas in the Village. Holiday lights will enhance the six-block surrounding area. From the owner: One-of-a-kind light show with programmed lights that go to the beat of songs by hip-hop artists. An interactive keyboard will also be added so people can press keys to make parts of the display flash. NOTE: Display is on every night from 5 – 11 p.m. (12 a.m. on Fridays and Saturdays). From 5:00 to 9:30 its only instrumental beats (still to hip-hop music) but after 9:30, the more popular songs are included that do contain some bad language here and there and he wants people to be aware of that. 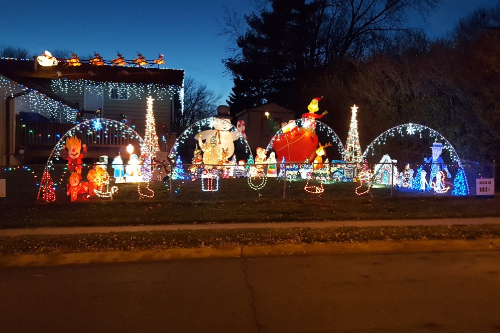 They do a massive Halloween display every year called “Nightmare on Redick Street,” and take it down just in time to share their “Winter Wonderland” with the community. 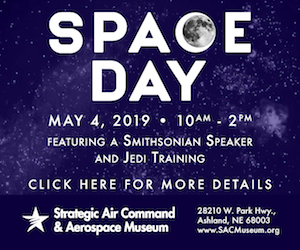 Su-Th 5 – 10 p.m., Fr-Sa 5 – 10:30 p.m. Frequency is 107.1 FM. We use incandescent and LED lights. If upper left window has a video playing, it’s frequency is 106.7 FM. Due to the videos, there is some silence in some videos and one might need to turn up the volume, remember to turn your volume back down when done. Sun-Th 5 – 10 p.m., Fr-Sa 5 – 10:30 p.m. Frequency of 107.5 FM. 48 channels of Christmas lights with many figurines. 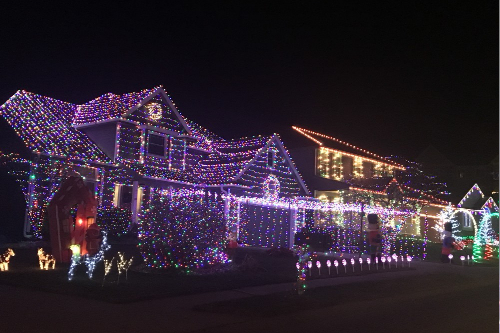 Monday-Thursday: 5:30-9:00 p.m. Friday-Sunday: 5:30-10 p.m.
With more than 9000 lights, this year they are teaming up with St. Jude Children’s Research Hospital and they need your support. Because the majority of St. Jude funding comes from individual contributors, St. Jude has the freedom to focus on what matters most—saving kids regardless of their financial situation. They want to help find cures and save children. If you would like to make a credit card donation, please visit their event page: http://fundraising.stjude.org/Asherin. Together, we can cure cancer. They are accepting donations to help those families whose children have cancer. Animated Christmas display with more features, songs, channels and lights added each year. Donations welcome for Make-A-Wish Foundation of NE with 100% of the donations going to them. 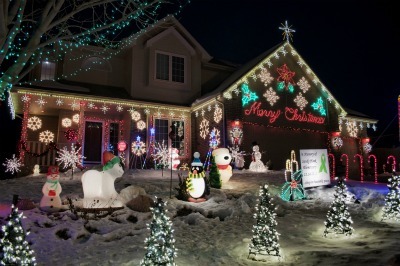 Entire corner is beautiful – many houses are decorated! The Steinauer Family Christmas Lights will premiere Wednesday, November 28! The lights are on everyday from 5:30 – 10:30 p.m. beginning Thanksgiving night. Tune your radio to 91.9 FM to hear the music that the lights are synchronized to. This year, this house has been completely overtaken by Charles Schulz’s Peanuts Characters. 2018’s Display features a 40′ x 20′ roof that has been beautifully designed with hundreds of yellow lights to look exactly like Charlie Brown’s signature yellow shirt, complete with Charlie Brown’s trademark giant black, squiggly line. The rest of the house has been outlined with sparkling yellow lights that run horizontally in many rows across much of the siding of the entire home. Red and green lights flash and shimmer around the windows, wreaths, and yard as they dance to over 30 choreographed Christmas carols, both old and new. Penguins, polar bears, elves, multiple Santa’s, Woodstock, Charlie Brown, and Snoopy, on top of his newly inhabited igloo, make this a definite display that is truly unique, and unlike any other home that you will see, both color-wise, and design-wise, in the Omaha area. Also, don’t forget to check out the back of the home, which can be viewed on State Street, in between Military Road and 156th Street. The backyard has been draped in red and white lights that cascade across the roof and perimeter of the home, and entire backyard as well. 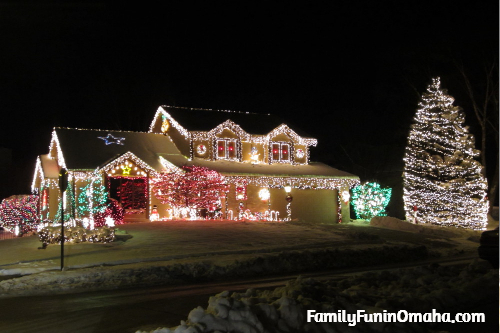 With wreaths, trees, candy canes, and seven 75′ strands of lights that fan out towards the street. The Christmas Lights will be on every night throughout New Year’s Eve, unless it rains. We hope that you get a chance to visit “The Charlie Brown Christmas House,” and wish you, and your family, a very Merry Christmas and Happy New Year! 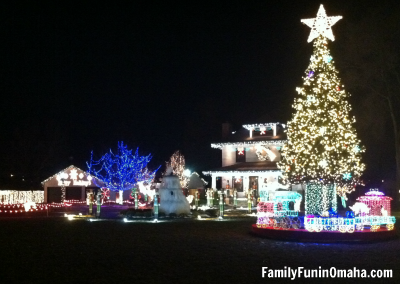 Over 30,000 lights on display – approximately a 45 minute show. Lighting Ceremony will be held at 4911 S. 24th Street (24th & N St.) on Saturday, December 1 at 5:30 p.m. Lights will shine brightly along 24th Street between L and Q Streets. Lights and blowups and all set to music. There will be a very nice walk-through display again this year. Thousands of lights and hundreds of blowmolds and Santa will be there again this year. Many of the houses on this street have a ton of lights and figurines, even a flying Santa and his reindeer. If you enter the neighborhood from the Bag N Save parking lot off of 51st and Harrison, you will see a sign from the neighborhood and Merry Christmas strung across the street. Santa Claus will be making his debut on Wood River Drive December 9th, 2018. Lights run from Thanksgiving evening through first week of January. Lights will be on 6 – 10:30 p.m. on weeknights and 11 p.m. on weekends. Songs played over the radio on 91.9 FM. Nightly computerized light show that’s broadcasted over a FM channel starting every night at 5 p.m. Computerized Christmas light show set to music, 6 songs for ~20 minutes. Back for 2018! 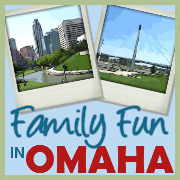 Sunday – Thursday, 6 – 10 p.m. Friday – Saturday, 6 p.m. – Midnight. Over 70 inflatables and over 6000 lights laser show for people to enjoy. 2018: Running through New Year’s Day. 5:30 to 11:00 Mon – Thurs and 5:30 – Midnight – Friday thru Sunday night. Features streets and streets of curbside trees lit up with Green lights on top and white lights on the trunks. It’s magical. Directions: Go north on 176th Avenue from Q Street; West on Orchard Avenue from 168th St; OR East on Orchard Avenue from 180th St.
Big Display of lights both in front and back yard. 2018: More led lights and more inflatables. Tune your radio to 91.9FM to listen to Christmas music synchronized to the lights. Thousands of lights sync’d to music via FM Transmitter. Dozens of inflatables, both sides of yard and house covered with decor. See video of 2013 show. Display combines Halloween and Christmas, and large inflatables. A fully animated display. Radio station is 94.7 FM. They also do a “Letters to Santa” box. Lots of lights and inflatables. Lights are synchronized to music, runs 5:30 until 9:30. 2018: The lights will go on sometime in December. Stay tuned to their Facebook page for updates. To get to the lights from Red Oak: 9 miles north on highway 48. Then 3 miles west on 110th street. Then turn south onto E avenue. Once you’re on E avenue you should see them. 1233 E Ave Red Oak, IA.